An Arizona prospector fell 100 feet down an abandoned mine shaft, and while waiting to be rescued, used a rock to battle and kill three rattlesnakes. John Waddell, 62, was rappelling into an old gold mine on his property when a rope gave way, sending him crashing to the shaft floor. He lay there with broken legs for three days, fending off deadly snakes with a rock, until a concerned friend went to check on Waddell and heard him shouting for help. He was taken to the hospital and is recovering well. “John is a tough SOB,” said neighbor Mike Balowski. A team of divers spent two days swimming in raw human waste to remove a massive clog of used wet wipes that had blocked sewer pipes in Charleston, S.C. 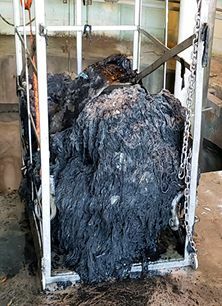 Although many wet wipes are advertised as “flushable,” they are too thick and strong to break down like regular toilet paper and are clogging sewage systems around the world. To reach the blockage, the divers swam to depths of 90 feet in total darkness, and used their hands to identify the obstruction. The divers were hosed down with a solution of “straight bleach” before removing their wet suits. “You should only flush No. 1, No. 2, and toilet paper,” officials said.